Benedict (or Ben) is a plainer male than most of his kind. he isn't one to stand out, so that works in his favor. one to naturally blend in with others instead of being the center of attention, he has small markings that distinguish him nonetheless. beauty, however, is in the eye of the beholder. some could claim he has a handsome face and a favorable body. 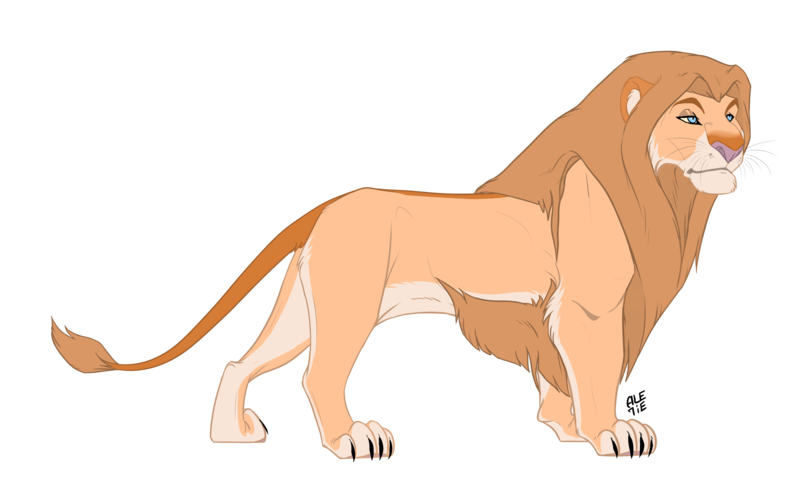 the lion isn't a very vain creature though, but he does keep himself clean even in the worst of times. his coat is a light ginger highlighted with darker ginger markings. he has a lighter underside to him in the ways of a very light cream blonde. he has a bit longer fur than normal, particularly heavy on the insides of his legs and underbelly. his mane is a light ginger, shaggy yet kept clean. Ben's nose bar is ginger, while he has a dorsal stripe running down the back of his head to his tip. also ginger. his ears have the same ginger rim to them, while his eyebrows are the same color. combining it all, he has baby blue eyes. At his heart, at is core, Ben is a funny guy. He likes joking around with people, making them roar with laughter. But lately, he's a bit serious when it comes to things. he does joke around but only with people he's comfortable with. He watches what he says around new people, setting them up with politeness to break the ice. He isn't that serious but more... understanding. A quiet understanding of people's woes and worries. He knows life is tough to many people and offers to listen if they need it. He's a great listener. Well-mannered to a fault, Ben is identified easily by his thick accent. It's like a butchered form of New York accent, more mumbling than anything. But despite being a shoulder to cry on, he keeps his own secrets close. Preferring nobody give him those 'sorry for the loss' and making it personal, making them compare his life to their own tragic past. He keeps himself to himself. It's about the future. But he can't help dwelling on things. Ben suffers from depression and Post Traumatic Stress Disorder. Often times he doesn't let people in, keeping them a respectable distance, and never allowing them to see him on the down. This guy has the most amazing ability to get himself in trouble. Whether it be from helping others out and landing himself in a pickle, or just walking in any direction he finds himself in. He has the capability to run to the aid of any woman in distress. He isn't sexist, believing that woman can do anything for themselves, but that's just how it is. It's just a thing he does. The need to save people, to protect them, stems from the invasion and loss he suffered. By constantly protecting people Ben is able to, in his eyes, make up for the failure he did with his parents. before baraenor;; lost both parents in a raid on his pride by rogues. the then-heir to their home was thrown out. was turned on by his former friends and developed trust issues. seeing his parents' deaths traumatized him and he developed a phobia of fighting and death. still has nightmares of their demise. two years before baraenor;; wandered for quite a while in search of a new home. nothing to see here. lots of stuff happened but nothing memorable. winter, year 6;; arrives in baraenor with the intention of settling down. met palancia, finley, maximelia, persephone and leo during his first winter. continued to be a rogue while eyeing the prides with interest. visited anima. spring, year 6;; visited vilmos lev twice. once to play with kazmer, palancia's son, and the other time to scout the territory. casually met ludovic, the archduke. after seeing the pride in action, he decided to start a rogue group called fiat lux after sant hem and anima disband. goes to vilmos lev to meet with piroska and anima to meet with lochlan. during this time, he is reunited with his cousin, thalessa. summer, year 6;; with imperio sangre disbanded now, baraenor is one pride less. benedict claims emerald vale for lux, his new pride and succumbs to his destiny of being a leader. several members go missing after a few months but they remain strong and gather new faces. summer, year 7;; all the prides disband due to strange reasons, and lux is no different. though he had kept it going for his whole reign, benedict is thankful for the support of his friends. Private Message: Send Benedict a private message.